Definition: The story behind what happened to the remains of Beethoven. 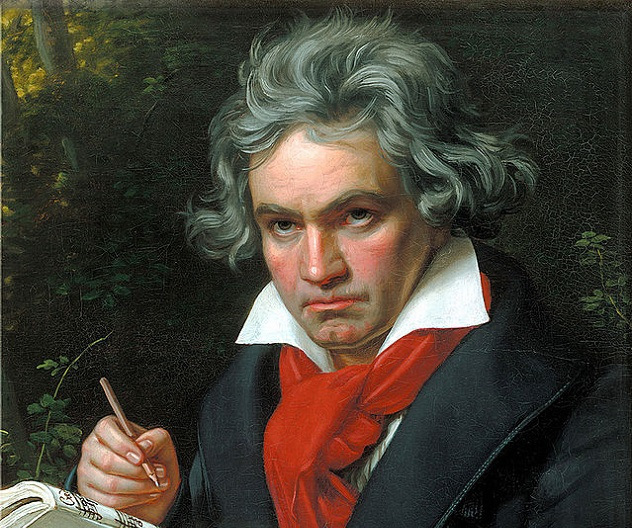 While he gave us some truly memorable pieces of music, Ludwig van Beethoven lived a difficult life that ended with a mysterious death in 1827. Diagnosed with pneumonia, Beethoven suffered some weird symptoms, including a swollen belly, a black spleen, and a dried-up liver. Even stranger, his remains were scattered across the planet, thanks to souvenir hunters and idiot doctors. During Beethoven's autopsy, the surgeon hastily chopped up his skull, spraying bone fragments everywhere. By the time he was finished, the skull looked like a puzzle with several pieces missing. Beethoven's temples were lumpy, his jaw was out of place, and he was missing his ear bones. The surgeon removed the ossicles with the hope of discovering the source of the maestro's deafness. Predictably, the bones disappeared. The next time any bones showed up was in 1990. Paul Kauffman was poking around an attic when he found a box labeled "Beethoven." Inside was a fragmented skull. Kauffman discovered that his great-great-uncle was a doctor who had dug up Beethoven's body in 1863 and possibly snatched his head. Of course, Kauffman was suspicious, so he asked experts at San Jose State University to take a look. After a DNA test, the scientists were pretty positive Kauffman had the real deal. What did experts compare the skull to? Beethoven's hair, of course. The composer's unruly mane attracted mobs with scissors and those strands ended up, well, everywhere. For example, we've mentioned the company that turned a lock of Ludwig's hair into a diamond worth $202,700. Other clippings made their way to establishments like the Library of Congress, the British Library, and the Beethoven-Haus, but the most fascinating story is that of the Guevara Lock. Shortly after Beethoven's death, a young composer named Ferdinand Miller snipped a few strands from his hero's head. In 1883, Miller passed the hairs to his son, at which point the lock disappeared until 1943. That's when the clippings somehow ended up in the possession of a Danish doctor named Kay Fremming. It's believed that a Jewish refugee gave him Beethoven's hair as payment for smuggling them out of Nazi-occupied Denmark. Finally, the lock traveled to London, where Dr. Alfredo Guevara and company purchased it for $7,300 at Sotheby's before donating it to the Beethoven Center at San Jose. Now that is one incredible journey.